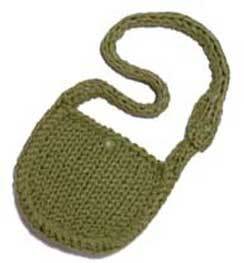 NOTE: A simple crocheted edge gives this purse added structure and keeps the edges of the strap flat. (Click on Learn for basic crochet on this website) If you do not crochet, an alternative method is to sew with blanket stitch or even a simple back stitch around all edges where single crochet is indicated. 8 stitches and 10 rows to 4" over Stockinette stitch (St st: knit one row, purl one row) with 3 strands held together and size 17 (12.75mm) needle. Depending on the yarns you select, you may need to use 4 strands held together to achieve the gauge. NOTE: Purse is knitted with three strands of yarn held together. Cast on 17 stitches (top edge). Work in St st until piece measures 5", end wrong side (WS) row. Next (right side: RS) row: knit two stitches together (K2tog), knit (k) 13, k2tog. Next (RS) row: K2tog, k11, k2tog. Next (WS) row: purl two stitches together (P2tog), p 9, p2 tog. Next (RS) row: K2tog, k7, k2tog-9 stitches remaining. Bind off loosely on next row. Cast on 3 stitches. Work in St st until piece measured 55". Bind off. With right sides facing and wrong sides together, pin one center panel to strap around sides and bottom curve, beg 3" from one end of strap and leaving approximately 19" of strap free at other side. With 2 stands yarn held together, work single crochet through both pieces to join. Continue to work single crochet around edge stitches of strap and when top of strap is reached leave loop on hook and pin other side panel to strap matching placement of first panel. Resume single crochet joining second panel to strap and continue single crochet all the way around second side of strap. Cut yarn and secure. Secure button in center of top opening as follows: Thread the end of a strand of contrasting color up through one hole of button and down through second hole, using tapestry needle to push, thread both ends of the strand into tapestry needle and sew to inside of purse 3/4" down from edge. Close purse by pulling button through center stitch of front panel. Sew second button to short end of strap 1 1/3" from end and use center st. Close strap by using center stitch of long end of strap as a button hole.